What we see here is a pair of unpainted Squid Head hardcopy arms. Return of the Jedi hardcopies tend to show up with the most frequency but this does not make them any less significant. Take notice of the color of the arms. 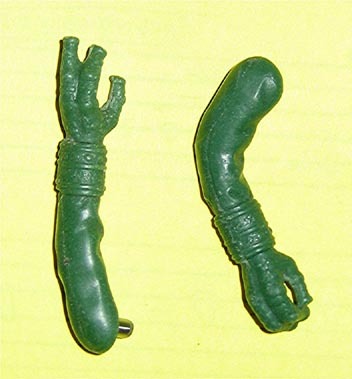 Since this is a post-1982 action figure it was cast in a green resin called Dynacast. Hardcopies are created in such a way so that they can be disassembled. They are normally held together with either metal or plastic dowels. As you can see these particular pieces have metal ones. Those interested in the Squid Head figure may also be interested in viewing an unpainted hardcopy belt and a first shot.